This coming Wednesday, December 7, 2011, will mark the 39th anniversary of the launch of Apollo 17-- the last of NASA's manned lunar missions. That mission launched in dramatic fashion at night, lighting up the skies over Florida, to bring to close one of the greatest chapters of US exploration. Aboard that mission was Commander Eugene Cernan -- the last man to leave his boot print on the moon. For luck, and in memory and homage to his father, Gene also took with him a $2 bill that flew on his other flights --- and was given to him by his father to fly on his first space flight. It is amazing to think that we have not returned to the moon in all those years…but, you can visit the bill that historically flew with and landed on the moon by visiting it at the museum! Apollo 17 Launches on December 7, 1972 for the last manned lunar mission of Apollo - on board is Gene Cernan's GT9A and A10 flown $2 bill, which was given to him by his father after his father carried it for years in his wallet for luck. 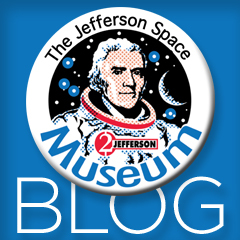 The bill is now a part of the Jefferson Space Museum collection. View it here.